The Center vets examined the bird when it arrived and found the branching Great Horned Owlet to be healthy. The bird was placed in a crate with fellow owlet #19-0148, who was already being introduced to non-releasable owl surrogate Papa G’Ho. Papa has been at the Wildlife Center since 2001; in 2002 he was declared non-releasable due to a wing injury. 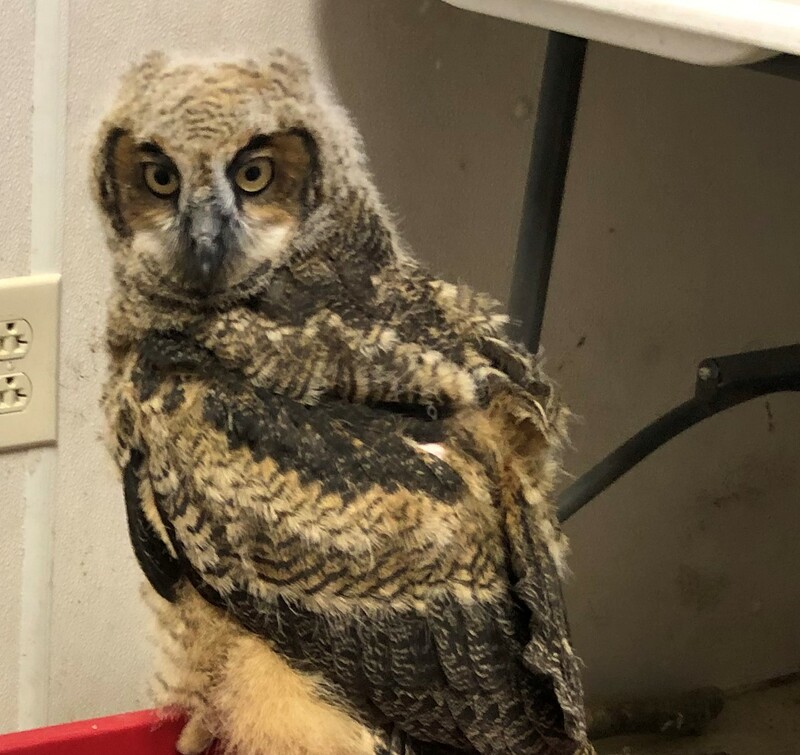 While Papa has never traveled on programs as an education ambassador, he has a critical job at the Wildlife Center – acting as a role model to young and impressionable Great Horned Owlets. The surrogate parent demonstrates proper behaviors for their species and reinforces their wariness of humans. This enables the young birds to be released back into the wild with appropriate behaviors, vocalizations, and reactions to humans. The two owlets settled in together; on April 8, the staff determined that both owlets were old enough to thermoregulate [maintain their own body temperatures, since no mother owl is available to keep them warm] and moved the owlets as well as Papa G’Ho to an outdoor flight pen. The rehabilitation team left the crate door open and the owlets soon joined Papa G'Ho on a perch. The owlets have been self-feeding from a plate of chopped prey twice a day; the rehabilitation team will continue to offer twice-a-day feedings for the next few weeks until the owlets’ interest in the morning feeding begins to decrease. The owlets will need to remain in care until they are old enough for release in the fall. Your donation will help provide supportive care to this owlet -- and our entire owl family! -- for the next six months! Thanks for your help.